I just spent a day working with Bob, the Chief Innovation Officer of a very smart large company I’ll call Acme Widgets. I pointed out to Bob the irony – in a large company “fear of failure” inhibits speed and risk taking while in a startup “fear of failure” drives speed and urgency. If we could understand the root cause of that difference, I said, we could help Acme build a system for continuous innovation. 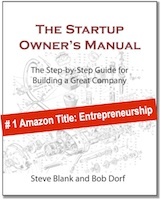 I suggested the best place to start the conversation is with the 21st century definition of a startup: A startup is a temporary organization designed to search for a repeatable and scalable business model. Startups have finite time and resources to find product/market fit before they run out of money. Therefore startups trade off certainty for speed, adopting “good enough decision making” and iterating and pivoting as they fail, learn, and discover their business model. The corollary for a large company is: A company is a permanent organization designed to execute a repeatable and scalable business model. That means in their core business, large companies have a series of knowns. They’ve found product/market fit (what products customers want to buy). They’ve learned the best distribution channel to get the product from their company to the customer. They’ve figured out the revenue model (subscription, license, direct sale, etc.) and how to price the product. They know the activities, resources and partners (manufacturing, regulation, IP, supply chain, etc.) – and the costs to deliver the product/service and have well defined product development and product management tools that emphasize the linear nature of shipping products to existing customers. There are financial metrics (Return on Investment, Hurdle Rate, etc.) for new product development that emphasize immediate returns. And everyone has job titles and job descriptions that describe their role in execution. Therefore, in a large company, failure to meet a goal – revenue, product delivery, service, etc.– is a failure in execution of an individual and/or organization to perform to a known set of success criteria. In corporations the penalty for repeated failure on known tasks is being reassigned to other tasks or asked to leave the company. As I sat with Bob and his innovation team, I realized that all of Acme’s new product innovation initiatives were being held to the same standard as those of existing products. Acme was approaching innovation and disruptive product ideas using the same processes, procedures, schedules, and incentives within the same organizational structure and culture as its existing businesses. No wonder innovation at Acme had stalled. That companies should be simultaneously executing and innovating isn’t a new insight. For decades others have observed that companies needed to be ambidextrous. So while we did not lack the insight that execution and innovation need to be separate, we did lack the processes, tools, culture and organizational structures to implement it. Corporate innovation initiatives have spent decades looking at other corporate structures as models for innovation when in fact we should have been looking at startups for innovation models – and adapting and adopting them for corporate use. That’s now changed. The strategy and structure for 21st corporate innovation will come from emulating the speed, urgency, agility and low-cost, rapid experimentation of startups. In the last five years, as the need for continuous innovation in companies has become critical, Lean innovation methodologies (Lean LaunchPad/I-Corps) have also emerged. These methods allow rapid experimentation – at startup speed – with the same rigor and discipline as traditional execution processes. Adopted by the National Science Foundation and large companies, over 1000 teams have used the process, and the resulting commercialization success speaks for itself. But running a Lean Startup inside an organization designed for execution is an exercise in futility. Working with large corporations we’ve learned that innovation groups need their own structure, culture, tools (Lean, Design Thinking, etc. ), metrics (validated/invalidated hypotheses, Investment Readiness Level) and processes. And both organizations – execution and innovation – need to understand that the success of the company rests on how well they can cooperate. Accepting failure and running at speed are part of an innovation culture. We need to separate out innovation risks from execution risks. 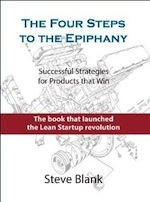 There are now proven Lean innovation methodologies (Lean LaunchPad/I-Corps) that we can use off the shelf in building an innovation culture without inventing our own. We need to make sure that management no longer uses execution metrics to manage and judge our innovation teams. Innovation means experimentation in searching for a business model. Often failure is the norm not the exception. Hi Steve, the world of large organizations- don’t you jusat love them, safe ,secure and frightened. The coronary for a large company will be: A company as a permanent organization designed to execute a repeatable and scalable business model…….will eventually die without treatment. Very succinct article. I’d also to point out the importance of having the senior management team on board. These new processes are very threatening to large companies with entrenched processes. Great insights on working with large corporations and fear of failure. I spoke to a VP of Innovation within a large med device company this last week, and this was the number one issue with killing projects quickly. I’m a big proponent of having the executive team work with the project team on determining the biggest project unknowns. It is up to the project team to resolve the unknowns through experimentation etc. Who says that the executives have to hold the key to all the answers and make all the project decisions, especially when the project team is closer to project issues. Management by exception and letting the facts drive the project reduces that fear…culture is complicated but it does lead to a higher level of trust and the wiliness to kill quickly projects quickly. Thank you for the interesting post. This is the exact same issue that is the topic of the famous book “The Innovator’s Dilemma” by Clayton Christensen. As someone who’s spent many years trying to drive innovation within a large corporation I’m very familiar with the issues discussed by Bob in your post. 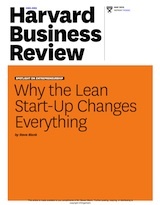 I’m also a firm believer and advocate of the lean start-up approach. It will be very interesting to see how these practices will be adopted in large corporations. Often the solution that large corporations choose (for very good reasons) is to identify start-ups that are developing the innovations they need and either invest, cooperate, or acquire (or all of the above) them when the timing is right. Some companies such as Cisco and Broadcom have become very successful using this approach. This is exactly right. Having been the corporate entrepreneur myself and business executive supporting startups from within a large corporation, I can attest to the dichotomy that exists between the operationally driven part of the business that drives efficiency and incremental innovations and the corporate entrepreneurship initiatives that drives new growth and disruptive innovations to create new businesses or lines of business. As an intrepreneur who designed, built, launched, and operated a global business hiring 150people in 15months, I insisted that the business was incubated from the ‘enterprise’ otherwise it would have died, primarily due to people. People become fearful of change and the leaders in an enterprise start-up can get pulled into that continuous mgmt briefing cycle, consuming valuable time in the build and external activity required. Former top-15 b-school prof turned corp stategist here. What you’re saying resonates strongly with my experience. I’d add that large companies tend to share a common, specific fear: They’re afraid that the potential innovation won’t cover declining revenues for the existing products/services. Rather than focusing on contribution margins, they over-index on gross margin %’s, setting the stage for the ultimate death spiral. For large enterprises, I have found that the main hurdle to innovation is the company’s annual planning & forecasting process. The finance function has to buy into the cost and risk of innovation in addition to the returns associated with them. Only when projects are seen as part of a portfolio, rather than a win/fail for each project. This approach accounts for failures and win… And holds all accountable. I would add a 3rd kind of failure: successful execution of a bad idea. By your definition of a large company as an execution machine, it may look for ideas it can shape to fit existing processes. I believe this is a different form of failure, because the idea is both supported by management and successfuly executed. Solution may be as suggested, implementing startup methods to test the idea before scaling up. least some of your colleagues. ah, my days as a public official in California. Kind of like interning in a sausage factory. Thanks for a great article. Very reassuring and hope it’s read by the leaders in the corporate world. Thanks for the article. I think gradually the debate is finally shifting towards the need for implementation as opposed to execution. Why? Implementation is more focused around configuring and execution is focused on the performance. Where you have established performance engines yes the need is on focusing on the execution. However, where you uncertainty – as you do an innovation based environment. The focus will then be more on implementation – my published article goes into more depth pls see my linked in profile if interested. I strongly feel this change in emphasis will allow the decision makers to use a set of tools to use their holistic faculties as professionals – intuition, feelings, the unconscious, etc – in a more effective way. These tools help the professionals to nurture their capacity for the required risk taking and understanding the complexity more effectively. I look forward to other thoughts and commnets. Well said Steve. I don’t believe we will overcome the word failure in a corporate culture considering the term failure has it roots all the way back to ~1643. What I do like about the “search” mindset is that it is a learning mindset. The key question is “what do we need to learn before we invest more time and money?” The methods you have created along with Alex’s tools are the conversation bridge to the operators. No longer is innovation seen as this nebulous non-measurable activity. Along with Alex’s canvases, launchpadcentral, and a configurable IRL companies now have a way to measure early stage ideas in a systematic way. From my view of being on the operation sides of companies as well as the innovative sides of companies I believe the methods help overcome the tug of war between the innovation engine and the operating engine. Fear is a factor…competition for funding and people is another major killer of innovation; the LaunchPad for Enterprise methodology helps create a common language, tools, and measurements.